Today, the mouse is mightier than the sword. HTML is the new paintbrush. <> is the new acrylic. Our coders are warrior artists, battling boring user experience, and fighting for your brand identity. Usable data is beautiful. Usable data presented beautifully is our Mona Lisa. We make Mona Lisas regularly for our clients. If you're not one already—a client, that is—you should be. Ok, we know it's weird that we love this stuff. It's just our thing. And we're ok with it. With a suite of digital tools, we empowered both audiences to connect. 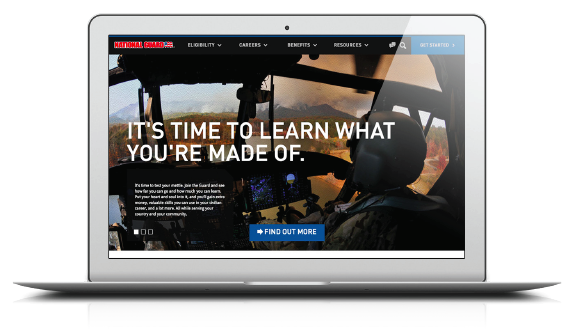 We equipped the hiring managers with a content marketing site with more than 30 original articles on hiring and retaining veterans, as well as a virtual job fair site to connect in real time. To prepare veterans, we created a web application to translate their military experience into civilian career skills—culminating in a single-page resume. Understanding that military spouses face similar challenges, we created an app customized to the military spouse experience. Additionally, we created a series of sites to inform veterans on civilian industry and state-funded military support across the nation, as well as 24/7-access to the virtual job fair. Within the first month of launch, the veteran resume app, Resume Engine, received more than 30,000 unique visitors.